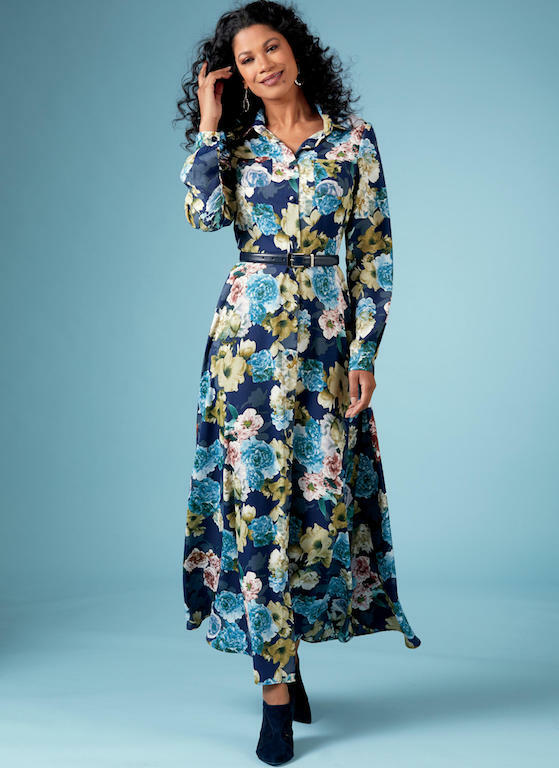 We have a new pattern collection from Butterick for Winter 2018, and I am somewhat underwhelmed with the options. I do like the corselette from Gertie, and will probably pick this one up during the next pattern sale (although my local JoAnns has been horrible about stocking current releases so who knows when that will be). It will be interesting to see what kind of directions are included with this design. The other new Gertie release is this fringed dress. Other than the sweet-heart neckline and the princess seamed bodice, adding fringe to the very popular Butterick 6453 would give you a very similar look. It is a cute dress, though. I was hoping for a sleeved retro look for Winter, though. 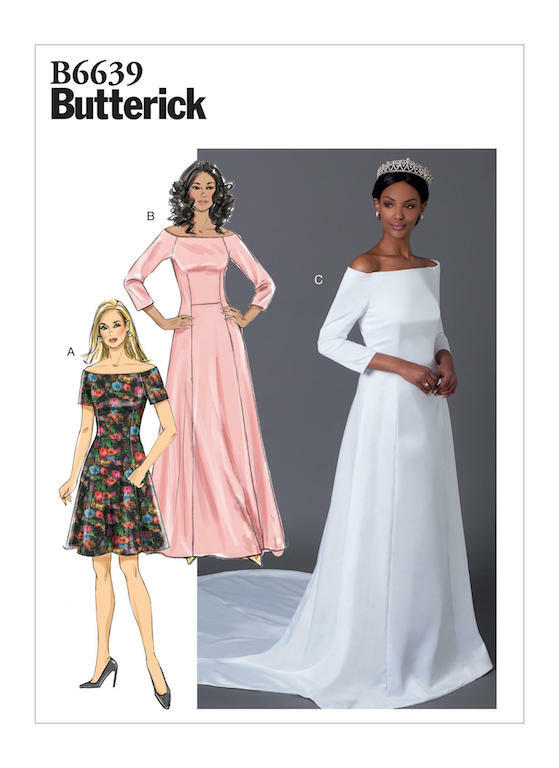 Here is the standard knock-off of one of the latest royal wedding dresses we have come to expect from Butterick. I had some issues with the original bridal gown (mostly to do with the fit of the bodice on the bride), however, there are some interesting style lines which could be fun to play with. I love the knee length version. The pattern is underlined and boned, so it sounds like there is a good foundation to be had by using the pattern as drafted. And actually, this bodice might have been useful in making my latest off-the-shoulder dress. I sure do love off-the-shoulder looks! Here is a super basic knit dress design, but since I don't have a lot of those, I am tempted by this See & Sew design. Does anyone else use the See & Sew patterns and have any comments? Then again, I haven't touched my serger since making this polka dotted gown, so perhaps knits are never going to be my favorite textiles and I should focus on the wovens. 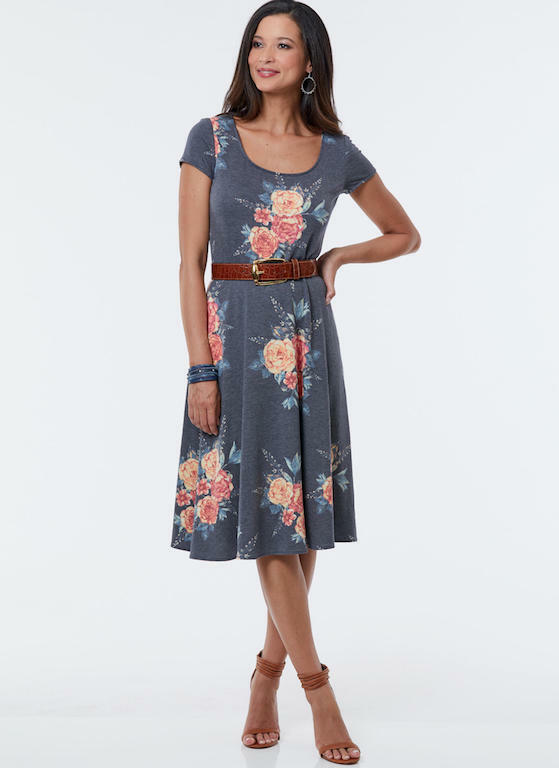 The other dress that I would consider is Butterick 6640. It's difficult to see with the busy fabric, but this is another take on the classic shirt dress which is included in a wardrobe pattern, so there are lots of options available. If I was more tempted by the other views, I might grab this one, but as it is, I probably have something very similar stashed away. 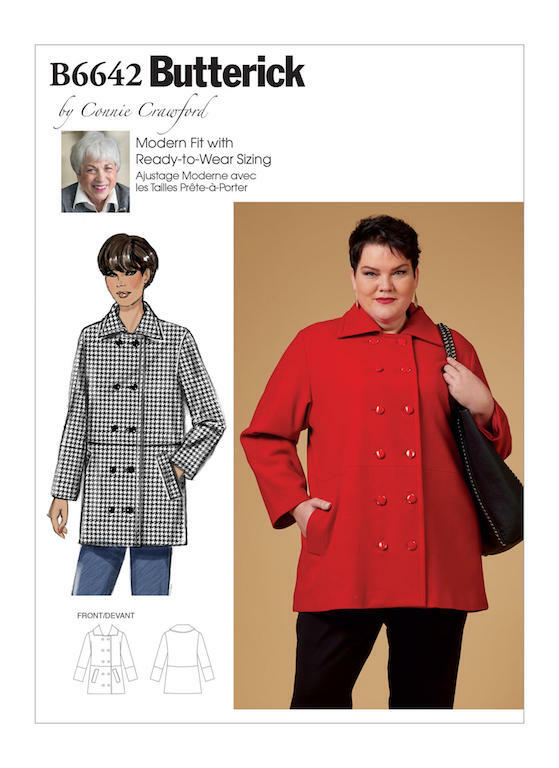 The only other pattern that caught my eye was the Connie Crawford jacket. The collar separation in the front is not my favorite detail, but I do like the waist seam paired with the double breasted silhouette. The Anne Klein design from Vogue Patterns a few seasons back definitely has a similar flavor, so I might just stick with that one. Overall, I am not all that impressed with anything. Which is fine, because I need to catch up on the 2.4 million other patterns that I have waiting for me at home (only exaggerating slightly!). I have sewn quite a few See&Sew patterns for my daughter who is seven. I don't think I have experience with their adult sized patterns except possibly a pair of pajamas? Anyway they're fine, comparable to any other patterns from butterick or simplicity in terms of instructions. I found the fit a little generous in terms of ease, although my mom who is a vastly more experienced sewer than I told me this is normal for children's patterns, so this may not translate to women's wear. I use my serger quite a bit (I do a lot of jeans making), but I generally do not enjoy sewing knits, either, and I realized it is nothing to do with the sewing itself, but rather the fact that I don't really enjoy wearing knit fabrics. I've had some See and Sew patterns over the years and they are the same as the other patterns. I've got some that are Vogue ( a cowl dress pattern) and Butterick (a cape pattern and the Lisette waterfall jacket). They usually only have one style or variation but they are a good bargain. Summerflies... my google comment thing doesn't work. I've used See & Sew. They are great for very beginners or if you just need a quick sewing win to reset your sew-jo. I also use them when I'm going through a "I need to sew down my fabric stash quick" spurt. I also found the latest round of Butterick's really underwhelming. Nothing new as far as design features or new techniques to try out. This corselette is interesting as I distinctly remember my mom wearing these. I remember a much smoother shape to the waistline, in other words, not so much of a jog out at the hips. In my early teens I even wore them a time or two. This looks far more uncomfortable than what I remember, more of the Scarlet O'Hara version. I can see Mammie lacing up Scarlet now! I don't think we want to go back there!